2017 Topps Star Wars Masterwork ($189.95 per box) arrives Wednesday at Sports Cards Plus, marking the third consecutive year for the high-end brand. Once again, it’s highlighted by a premium insert in every pack. Each four-pack box promises a pair of autographs. The premium nature of 2017 Topps Star Wars Masterwork starts with the base set. 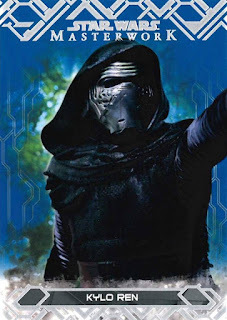 It has 100 cards, including 25 short prints, adding to the collectability of the base set. Instead of regular card stock, they are a thick 72 pt. That makes them about as thick as memorabilia cards. Parallels land at least one per pack with the most common being Blue. Numbered versions come in Green (/99), Purple (/50), Gold (/25), Printing Plates (1/1) and Red (1/1). 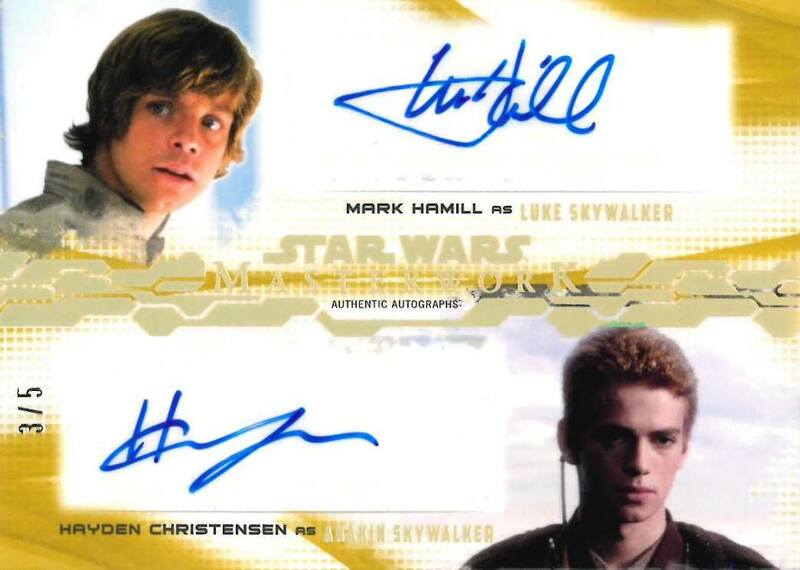 2017 Topps Star Wars Masterwork has a wide-ranging autograph checklist. More than 60 actors are included, covering all of the original films, prequels, The Force Awakens, Rogue One, as well as the animated Clone Warsand Rebels. Many of the actors that attended the Star Wars Celebration in Orlando this past spring have signatures in the set. Felicity Jones, Forest Whitaker, Freddie Prinze Jr. and Billy Dee Williams are all included on the checklist. Also included are Sarah Michelle Gellar and Alan Tudyk, who are new to Star Wars trading card autographs this past year. Autograph parallels include Rainbow Foil (/50), Canvas (/25), Wood (/10), Silver Framed (/10 or less) and Gold Frame (1/1). Also randomly inserted are Autograph Pen Relics that have pieces of the pen used in the signing, Dual-, Triple-, and Quad Autographs. And then there’s an Accordion Book Card Autograph that has 20 total signatures, most of which are among the biggest names to ever appear in the series. A tribute of sort is paid to the late Kenny Baker with a series of dual, triple and quad Alongside R2-D2 Autographs. 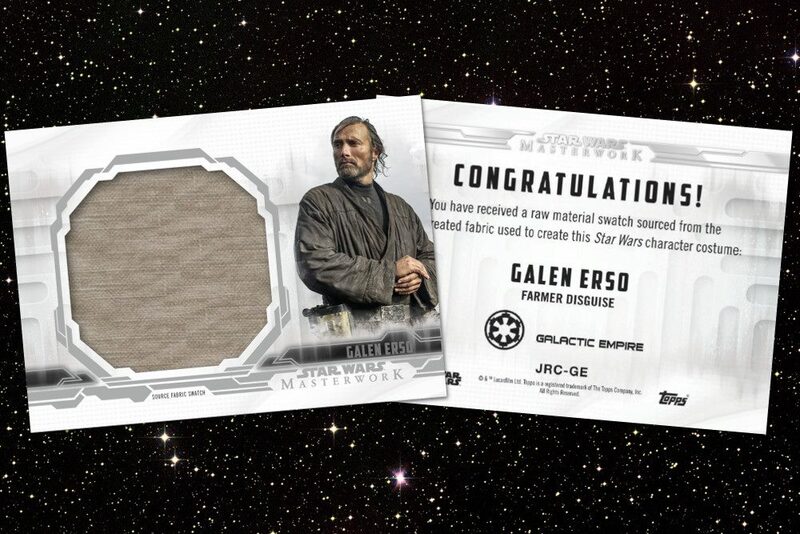 Two autographs are included in each box of 2017 Topps Star Wars Masterwork. The other two box hits come from a variety of premium inserts. Sketch Cards come with original art done on them. These have parallels. Droid Medallions highlight the robots of the Star Wars Universe. 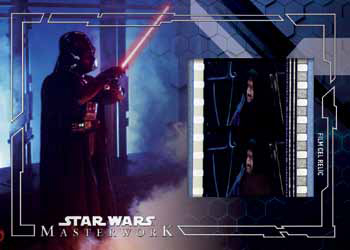 Film Strip cards come with celluloid frames from prints of the movies. The idea here is that because each frame is a little bit different, each card can be considered unique. New to 2017 Topps Star Wars Masterwork are Animation Cel cards. 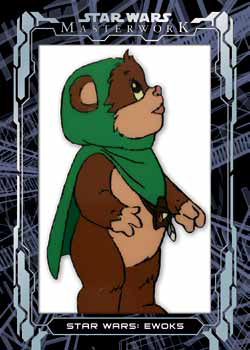 These use pieces of the actual frames used to make the Ewoks and Droids cartoons released in the 1980s following Return of the Jedi. Source Material Fabric Relics were a last-second addition. These have swatches of fabric used to make eight costumes in The Force Awakens and Rogue One. They’re not cut from the actual costumes. These are inserted in packs as redemptions. They’re also bonus hits and don’t count towards the promised premium inserts. Like the first two Star Wars Masterwork releases, the inserts aren’t all just of the hit variety. 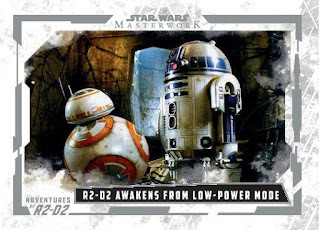 2017 Topps Star Wars Masterwork has three new insert themes that focus on the saga’s protagonists: Hall of Heroes, Evolution of the Rebel Alliance, and Adventures of R2-D2. These all have parallels done on different styles of card stock: Rainbow Foil, Canvas, Wood, Metal , Gold Tinted Metal, and Printing Plates. Click HERE for a complete Checklist from Topps.